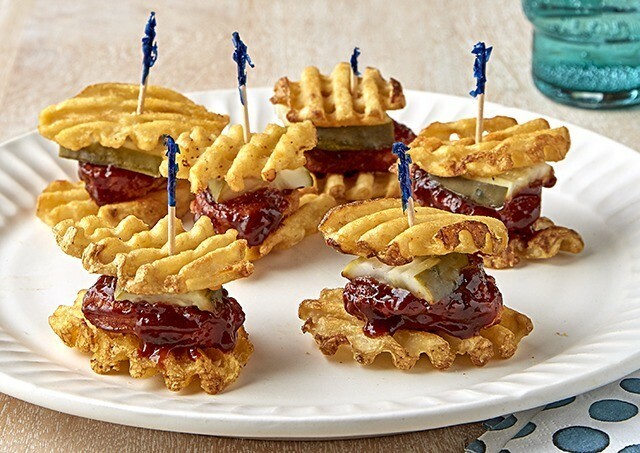 Bake waffle fries and chicken nuggets as directed on packages. Meanwhile, mix barbecue sauce, ketchup and red pepper in small bowl until blended. Place 12 waffle fries in single layer on serving plate. Dip chicken nuggets, 1 at a time, into barbecue sauce mixture, turning to evenly coat both sides of each nugget; place on fries on plate. Top with dill sandwich pieces and remaining waffle fries. Insert frilled toothpick through top of each to secure. Prep Time 10min. Total Time 30min.